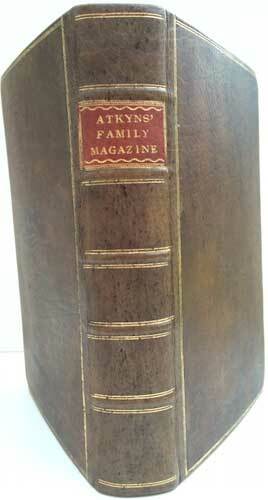 Atkyns (pseud). Arabella - the very rare 1st edition. Part 1. 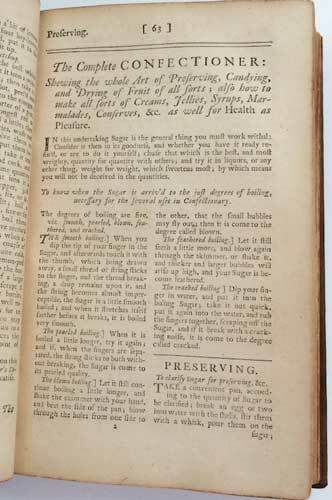 Containing Useful Directions in All the Branches of HOUSE-KEEPING and COOKERY Particularly Shewing How to Buy-in the Best of all Sorts of provisions; As Poultry-Ware, Butchers-Meat, Fish, Fruit, &c. With several Hundred Receipts in COOKERY, PASTRY, PICKLING, CONFECTIONARY, DISTILLING, BREWING, COSMETICKS, C. (a single line) PART 11. 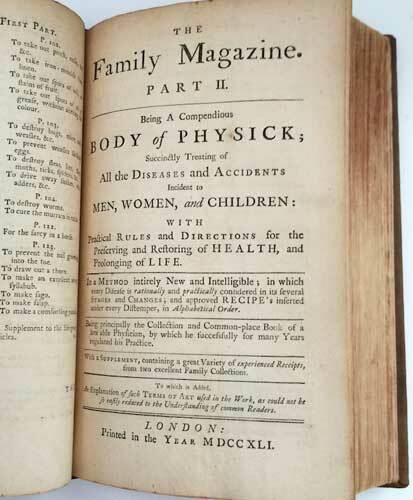 Containing A Compendious BODY of PHYSICK’ TREATING All the Diseases and Accidents INCIDENT TO MEN, WOMEN, and CHILDREN: WITH Practical Rules and Directions for the Preserving and Restoring of Health, and Prolonging Life. (a single line) In a Method intirely New and Intelligent; in which every Disease is rationally and practically considered, in its several Stages and Changes; and approved RECIPE’s inserted under every Distemper, in Alphabetical Order. 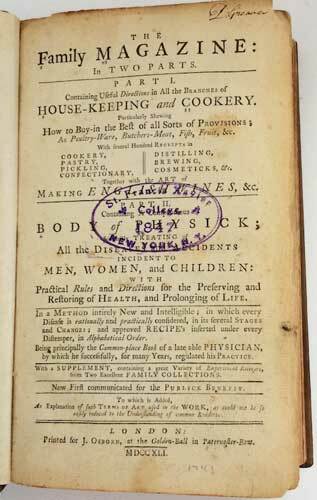 Being principally the Common-place Book of a late able PHYSICIAN, by which he successfully, for many Years, regulated his Practice. (a single line) With a SUPPLEMENT, containing a great Variety of Experienced Receipts, from Two Excellent FAMILY COLLECTIONS. (a single line) Now First communicated for the Public Benefit. (a single line) To which is Added, As Explanation of such Terms of Art used in the WORK, as could not be so easily reduced to the Understanding of common Readers. ( a double line) LONDON: Printed for J. Osborn,at the Golden-Ball in Paternoster-Row. (a single line) MDCCXLI. 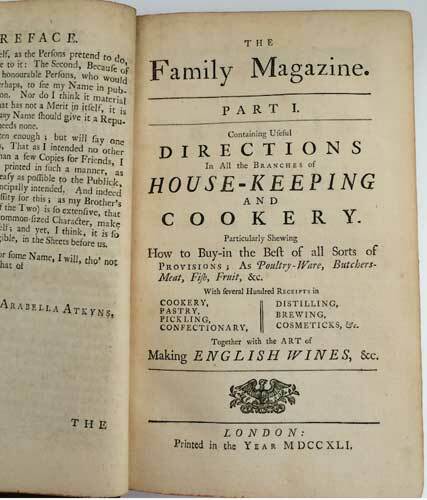 FIRST EDITION 1741. 8vo. 1fep. Title page, with a library stamp of St. Francis Xavier College 1847. New York, N.Y. On verso the same library stamp. iii-xiv The Preface. 2nd Title page to Part 1. (1)2-123. 3p Index to the first Part. Title page to Part 11, with the same library stamp, also on the verso. iii-xiv The Preface. 2nd Title page to Part 11. (1)2-270. 271-315 Supplement. 316-318 Explanation of difficult words, also has the library stamp on p318. (2)321-324 Index. 1fep. There are some illustrations in the text for placing dishes on the table. Sometime rebound by Beranad Middleton in full period style speckled calf, with his signature in pencil on the lower inside back pastedown. The boards bordered with double gilt lines. Spine with raised bands and gilt lines with red label in gilt lettering and lines. Old tape repair to p13-14 of part 11. Skilful paper repair without loss to p303-304, also has the library stamp at the bottom of p304. A little age browning to first and last few leaves, but overall a very good copy. - Arabella Atkyns was a pseudonym coined by the author who states in the preface “Being still teized [sic] for some Name, I will, tho’ not my right one, subscribe to That of Arabella Atkyns”. Oxford states on p72 that part 11, the medical section is taken from a common-place book of her brother who was a Physician. She also apologises for including treatments for maladies which a lady can hardly be expected to include. Oxford further states that the cookery section is well arranged, but the medical part is full of horrors. The treatment for appendicitis is ‘to apply a live puppy to the naked belly’ and follows up with a cataplasm of rotten apples or of ‘sheeps-dung boil’d with milk’. 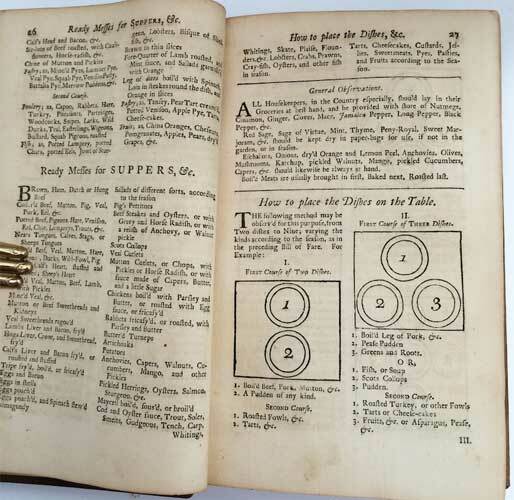 It is believed that Hannah Glasse borrowed much from this book for her ‘Compleat Confectioner’ circa 1760. MacLean has the 1st and cites a 2nd of 1743, 3rd of 1747, 4th of 1754. Oxford p71. Axford p143. Bitting p550. Craig p478. MacLean p49. Pennell p150.